River Terrace Prairie SNA features a rare gravel prairie on a terrace above the Cannon River valley. The northwest-facing slope of the terrace is the best place to view native wildflowers in the spring. Visit in early May to see blooming American pasqueflower, mid-May for prairie smoke and kittentails, and late May for fringed puccoon and prairie violet. The old field below the terrace is a work in progress. 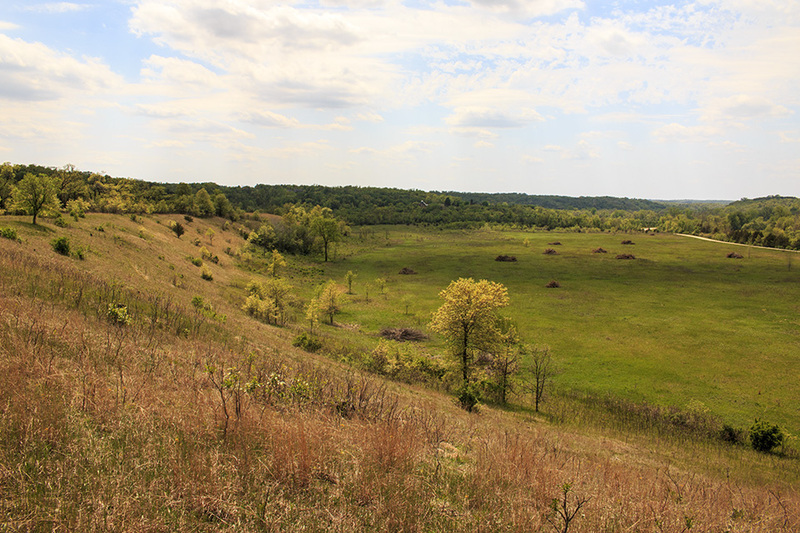 Recent management activities in this area include cutting and stacking eastern redcedar and mowing down other woody species. A prescribed burn north and east of the terrace was conducted in the spring of 2017. This entry was posted in Nature Destinations and tagged River Terrace Prairie SNA on May 31, 2017 by John Valo. 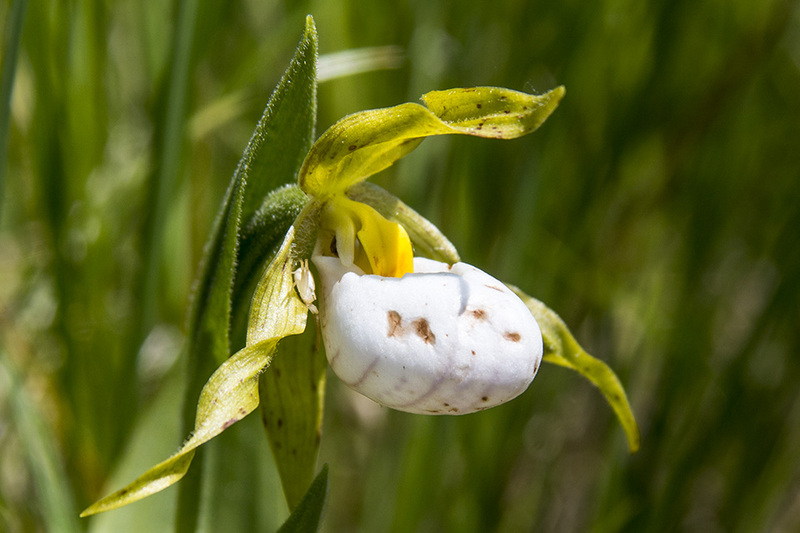 Many species of orchids are found in Minnesota prairies, but only three are prairie specialists: western prairie fringed orchid, Great Plains ladies’ tresses, and small white lady’s slipper. They all occur in lime-rich sediments deposited by glaciers and in clay-rich soils of glacial lake beds. Small white lady’s slipper (Cypripedium candidum) is widely scattered but uncommon across the Great Lakes states to the Dakotas and adjacent Canadian provinces. Minnesota is the core area of the species and may have more individual plants than all other states and provinces combined. It is found in relatively undisturbed, high-quality prairies in the western, southern, and metro regions of the state. Small white lady’s slipper produces small flowers that are easily overlooked. The best time to see it in bloom is … right now, the last week of May in southern Minnesota and the first or second week of June in the north. This entry was posted in Plants and tagged Cypripedium candidum, small white lady’s slipper on May 28, 2017 by John Valo. Sigmoid prominent (Clostera albosigma) is a medium-sized, heavy-bodied, nocturnal moth. It is the most common of the four Clostera species found in Minnesota. Adult moths are found from mid-May to mid-August in deciduous woodlands and forests, and in shrubby wetlands and fields. A sigmoid prominent adult has grayish-brown wings, a dark brown head and upper thorax, and on the male, a dark brown tuft at the end of the abdomen. The wings are crossed by four pale lines. 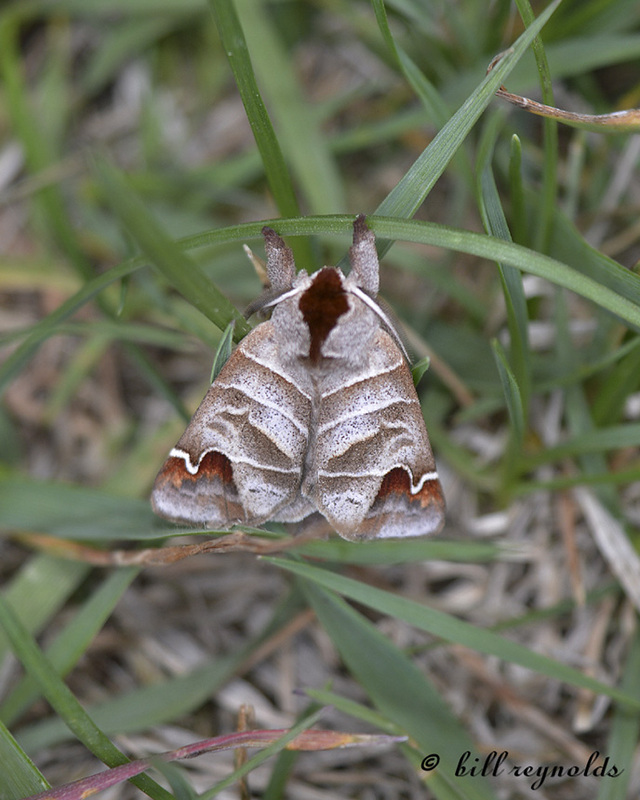 A dark, chestnut-brown area near the end of the forewing is sharply delineated by a prominent white “S”-shaped bar. The species name albosigma means “white S” and refers to this marking. Spring individuals are darker with more highly contrasting markings. Summer individuals are paler and less conspicuously marked. The caterpillar feeds mostly on quaking aspen, but also on poplar and willow, and sometimes on alder, birch, maple, and elm. It is a solitary feeder. During the day it curls up a leaf of a host plant and sticks it together with silk webbing, make a shelter where it can feed in safety. Adults do not feed. This entry was posted in Insects and tagged Clostera albosigma, Sigmoid prominent on May 18, 2017 by John Valo. Gabled False Morel (Gyromitra brunnea) is the most common false morel in Minnesota and Wisconsin. It is found in the spring, alone or in groups, on the ground under hardwood trees. The cap is tan to reddish-brown, 2″ to 4″ wide, and loosely wrinkled. It is usually saddle-shaped or winged, divided into 2 or 3 strongly projecting lobes that are fused to each other. 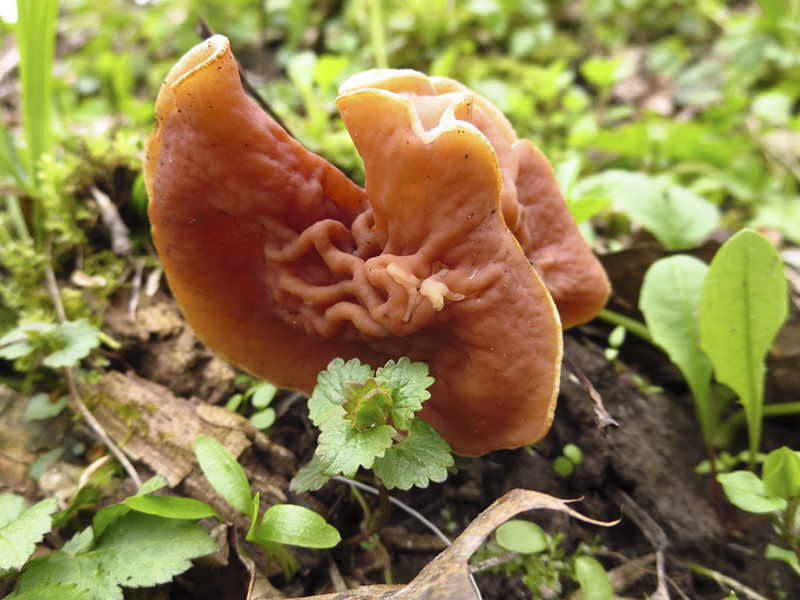 This entry was posted in Fungi and tagged Gabled False Morel, Gyromitra brunnea on May 15, 2017 by John Valo. Snow Morel (Gyromitra gigas) is a common early mushroom in forests of North America. It is called a “false morel” due to its similarity in appearance and seasonality to true morels. It is found in the spring and early summer alone, scattered, or in groups, on the ground or on rotten wood, under coniferous or hardwood trees, often poking through leaf litter. It is saprobic, obtaining nutrients from rotting wood, and might also be mycorrhizal, having a mutually beneficial relationship with the tiny rootlets of trees. It may exhibit both traits at different parts of its life cycle. Snow Morel is edible if sautéed but not edible when raw. Some authors suggest that it be avoided due to its similarity in appearance to the poisonous False Morel (Gyromitra esculenta). Snow Morel is identified by the squarish, blocky, convoluted cap that is compact and rarely has projecting lobes; and the massive, ribbed or longitudinally wrinkled stem that is often mostly or completely hidden by the closely appressed cap. 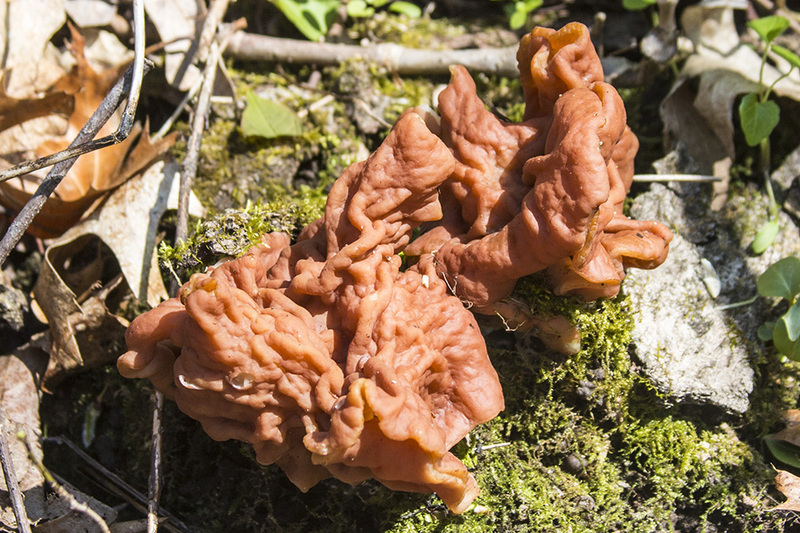 This entry was posted in Fungi and tagged Gyromitra gigas, Snow Morel on May 9, 2017 by John Valo.